The printer is complete, as in the included images. 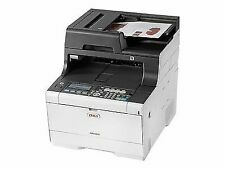 OKI MC563DN (A4) Multi Function Printer (Print/Copy/Fax/Scan) 1GB 1200x1200dpi 30ppm 350 Sheets ADF (White) Network Ready/Duplexed. Keeping productivity high and seamlessly connected. Low power consumption and duplex printing as standard. OKI MC562dnw A4 Colour Multifunction LED Laser Printer. Designed to suit heavy workloads with ease and without complication, this printer can take the stress out of professional standard printing, copying, scanning and faxing. 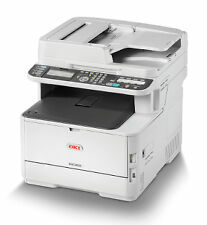 OKI MC873DNV A3 Colour Laser Multifunction Printer. 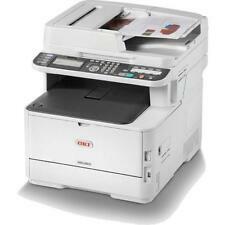 OKI MC873DNV A3 Colour Laser All-in-One Printer 45850625. Despite the versatile range of functions provided by the MC873dnv, the printer has been designed to be incredibly simple to use. High performance A4 mono printing for the more demanding user. Laser Printers. Maximum resolution: 1200 x 1200 DPI. You get real peace of mind with a B432dn. 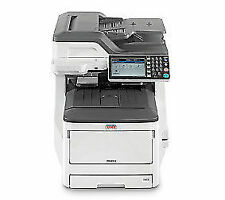 B432dn_If you need a black & white printer that supports the highest levels of office productivity, without straining your budget, you need the B432dn. 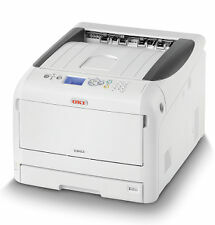 OKI MC853DN - multifunction printer (colour). Tech Data Product Data Sheet - OKI(45850603). Product Data Sheet - Brochure - OKI(45850603). OKI MC853DN. Original SizeA6 (105 x 148 mm) (min) - 297 x 431.8 mm (max). 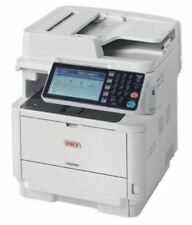 Duplex printing reduces paper usage (optional on C823n). 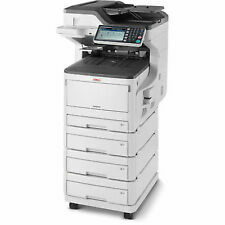 A3 Colour Laser Printer, A3 13 ppm Color / 13 ppm Mono, 1200 x 600 dpi. With a low initial capital outlay, the C823 is ideal for quality in-house colour printing on any budget. B432dn_OverviewIf you need a black & white printer that supports the highest levels of office productivity, without straining your budget, you need the B432dn. You get real peace of mind with a B432dn. 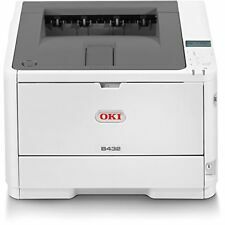 OKI MC363dnw (A4) Colour LED Wireless Multifunction Printer (Print/Copy/Scan/Fax) 1GB Backlit LCD 30ppm (Mono) 26ppm (Colour) 45,000 (MDC). The MC363dn is easy to set-up and use with a range of eco-friendly features that save energy and help to lower running costs, including duplex printing as standard.